The eastern spadefoot toad is the rarest frog species in Massachusetts. It gets its name from an elongated, crescent-shaped spade on each hind foot, which is used for digging. 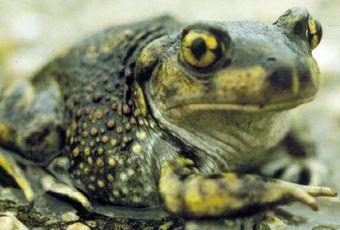 These special toads are currently endangered, and their status in the state is listed as “threatened.” Staff from the Long Pasture Wildlife Sanctuary will explore the secret life history of this elusive and little known species with our audience, using unique and seldom seen photographic documentation. They will also introduce Mass Audubon’s one of a kind conservation project aimed at protecting the eastern spadefoot toad population on Cape Cod. Come and learn to love this unusual amphibian!